It is well known that the Eternal Prophet reigns over the realm of reverie where exerts his subtle influence on the dreams and visions of the mortals of Visola. On the other hand, he’s also attributed to the nightmares and unrelenting fear that often poisons the mortal mind. Having molded the greatest mountain range on the continent to suit his creation, the giant race, Faledric is also associated both with the rocky peaks that distort the topography of the world and the giants that call them home. The second immortal to emerge from the mists, Faledric is nearly as old as time itself and exhibits a calm, wise demeanor that suits it. While the other Gods played with their creations extravagantly, trying to create impressive races of wild imagination, Faledric spent his time carefully pondering the creation of his massive child race, the giants. What he may not have given them on the exterior, he imbued within their immense frames by giving them the gift of telepathy so that they might have the nearest ability he could give them to his piercing vision. Where he could see through time, they could see through their brethren’s thoughts. As time passed, the Eternal Prophet carefully tended to his mountain flock until the years of conflict came to pass, when he once more withdrew to observe the actions of his fellow immortals and their results in the mortal realm. It was during this age that Faledric most notably began to assert his presence, with visions becoming more commonplace and dreaming nearly a nightly encounter for most mortals. 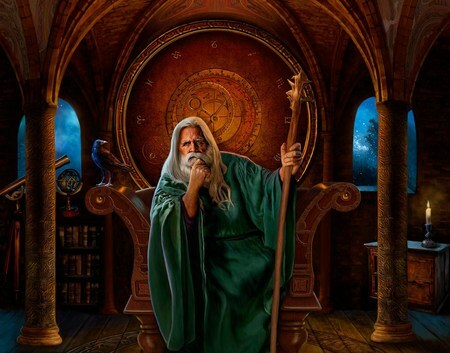 Like fate bends for no man or woman, Faledric, in his role as the observer of the what lies ahead on the tides of time, has been well characterized as unsympathetic and unyielding. Much like the mountains to which his followers will often flock, as he distributes prophecies to his priests and other mortals he deems worthy he does so in stolid resignation. Only very rarely in continental history has it been noted that Faledric has taken steps to alter the course of history, which he sees so clearly, but mostly the Lord of Prophecy prefers to communicate what the future may bring to those who are in a position to act. Even Faledric’s highest priests will rarely come face to face with the Mountain God, who prefers to watch the mortals at play in the realms below his perch in Caelestis, where his nearly unnoticeable proddings may never be as overt as the acts of the other Gods, but in some scenarios may have a much more profound effect. The few occasions where he has graced the people of Visola with the humbling presence he has done so through the medium of dreams and visions or occasionally allowing his aged, giant frame to ripple briefly in the waters of a scrying well in one of his many temples. Having exerted only minimal influence during the historic downfall of the God of War, Faledric has been noted to pay almost as little attention to his godly brethren as his mortal followers. Stoic and neutral in almost all affairs, he mostly avoids the internal quibbling of the immortals and prefers to gaze steadily through his all-seeing eye, only occasionally returning to the present when he believes the situation so suits it. Very rarely though, when the other inhabitants of Caelestis cause conflict worthy of his attention, he will step forward from his solitude and make his presence known.